The first Saturday in June found Jenna Jones and her daughter on their way to Moonlight Harbor, towing behind their car a tiny rented trailer filled with their most valued possessions—scrapbooks, crafting supplies, clothes, Sabrina’s bike and Jenna’s massage table and oils and other business necessities, just in case she needed to supplement their income from the motel. Or in case she got the itch to do massage, which was highly likely, since she loved what she did. Most of the furniture had been sold, and that had given her some extra cash. Her linens and the Wedgwood china Gram had given her had been stored in Mom’s basement, along with Sabrina’s bedroom set, after Jenna realized that would have been the final straw for her daughter. “Aunt Edie will have a bed for you,” Jenna had assured her. “Honey, this is going to be our home.” At that, Sabrina had looked thunderous, and Jenna’s nervous tic had reappeared. “Okay, we won’t sell your bed.” No bed selling. Taking Sabrina out of school early turned out to be the one thing Jenna had done right in her daughter’s eyes. Sabrina’s grades weren’t getting any better. Her teachers were all mean, and she hated school. Jenna hoped she’d be in a better frame of mind come fall. Daddy didn’t bother to come see his daughter off. Instead, he’d texted her. Have fun at the beach. Keep an eye out for detritus for me. As always, all about him. “She doesn’t want to go, you know,” he’d told Jenna when he’d dropped Sabrina off the week before, after a father-daughter run to Dairy Queen that Sabrina had instigated. “She’ll like it once she’s there,” Jenna had insisted. If she kept saying it often enough surely it would become true. “And it will help the budget if we have a place to live rent free while I help my aunt run the motel.” She’d conveniently neglected to inform him that she was going to inherit said motel. She may have been stupid when she’d married him, but she wasn’t going to be stupid now that she was divorced from him. Yep, all about him. “You mean I’ll have enough to pay you what you’re leeching off me,” she’d said, which had sent him roaring off in his truck while Jenna was left steaming. Now, though, as they entered Harbor County, home of beachside towns, fishing ports and relaxation, the frustration and fury got left behind like unclaimed baggage. So what if the sky was gray and drizzly? The future was sunny. They crested the rise outside of Aberdeen and, in between the giant firs, caught sight of the Pacific Ocean in the distance. “There it is,” Jenna said, sounding like an Oklahoma land-rush pioneer pointing out the Promised Land. Sabrina was plugged into her iPod and ignored her. So far her enthusiasm for their new adventure had been underwhelming. But wait till she saw the town. Jenna could hardly wait. Other than one quick visit after her high school graduation and a honeymoon weekend with Damien, she’d been MIA since her sophomore year in high school. Her first real job, working at the local McDonald’s, had kept her away. Then came the friend with the house on Hood Canal, where there were boys galore, followed by a couple of boyfriends. Then, of course, along came Damien, who didn’t fall in love with Moonlight Harbor like she’d hoped. After they married it seemed as if every time she planned to visit her aunt something came up that prevented her. Damien demanded a lot of attention. Actually, more than a lot. Looking back on her life, it seemed she’d married a psychic vampire. As their marriage progressed, he grew bigger and she grew smaller, an insignificant planet orbiting him. She’d been crushed when he’d found another woman. Now she couldn’t help but wonder if Aurora had actually done her a favor and set her free, allowing her to come back to a place that had given her a happy childhood. Maybe it would give her a happy adulthood, too. That last item on the list made Sabrina smile, proof that she’d been able to hear her mother all along. At last they reached their destination. There was the same white-rock gateway to the town that Jenna remembered, one of the first things to go up when the town was new. Hmm. She didn’t remember the molehills rising like tiny mountains from the grass on both sides of the gateway. But there were flowers in the flower beds. Someone cared. And maybe they didn’t want to hurt the moles. She knew the many deer who roamed the town were a protected species, so why not the moles? They turned in and started down the main road through town, Harbor Boulevard, named for the harbor that sat at the south end of town. Once a bustling harbor with a ferry service to Westhaven, a busy fishing town across the bay, it had gotten silted in over the years and was no longer viable for commercial use, although the pier was still there. The town’s lifeblood was now tourism, and shops and restaurants abounded, with a couple of small, dated motels sandwiched in between. Many of the businesses were housed in buildings that had gone up in the sixties. But some new buildings had also sprung up, including an eye-catching group of cabana-style shops all painted in beachy colors of turquoise and mint green, yellow and an orange that made Jenna think of Creamsicles, offering everything from women’s clothing to kites. In spite of the drizzle, people were out shopping. Many of them were seniors (hardly surprising, considering the fact that there was a large retirement community there), but Jenna saw a few young families and some couples, as well. Where were the cute boys? Jenna stole a look at her daughter. She was assessing the town, and so far she didn’t look impressed. Farther ahead, on the left, sat Good Times Ice Cream Parlor, one of Jenna’s favorite haunts when she was her daughter’s age. Right next to it was the Go-Go Carts go-cart track and the Paradise Fun-Plex, which consisted of a miniature golf course and an arcade. This should improve Sabrina’s mood. Indeed it did. Her daughter was actually smiling. “You ready for ice cream?” Jenna asked. Sabrina nodded, and they pulled in. The parlor itself was housed in one-half of the square building, painted pink with white trim. A couple of teenage girls and a boy with scraggly hair, wearing a Seahawks sweatshirt over baggy jeans, stood at the counter, selecting ice cream while the pimply-faced boy behind the counter waited for them to decide. He caught sight of Sabrina, and his eyes widened in appreciation. She gave him a discouraging frown. His customers turned to see what he was staring at, and the other boy smiled at Sabrina. She smiled back, but the two girls gave her the stare of death, which of course brought back her frown. Meanwhile, the woman with the squalling child and rambunctious boys had finished paying and left, leaving the woman behind the counter free to wait on Jenna and Sabrina. She was in her sixties with a smile as wide as her girth. Her hair was almost all gray now, but Jenna would know that round, smiling face anywhere. Nora Singleton had been dishing out ice cream since Jenna was a kid. “Hello, ladies, what will you have?” she asked. “I’ll have a big order of sunshine,” Jenna said, quoting what she used to tell Nora whenever it was raining. “It’s been too long,” Jenna agreed. “Sand Pebble?” Sabrina scanned the tubs. “What’s Butter Brickle?” Sabrina asked. “Obviously, not enough ice cream,” Jenna said. “I did, too, until I discovered Sand Pebble and Wild Huckleberry,” Jenna said, and started the car. They continued down Harbor Boulevard past more shops and restaurants, many looking a little tired and in need of paint, and a place to rent bikes and mopeds. “Can we do that?” asked Sabrina. “When you’re old enough to drive,” Jenna said, making her frown. More tourist treats awaited them past the roundabout. “What’s that?” Sabrina asked, staring at the building with an entrance shaped like a giant gaping shark’s mouth. More motels began to appear—a Quality Inn, a Best Western with a restaurant sandwiched between, and a beautiful old Victorian B and B with a long front porch, complete with wicker chairs for lounging. It was painted white with blue trim. One word summed it up: charming. “Does our motel have a restaurant?” Sabrina asked. The two cars in front of them began to slow down. “Why’s everybody stopping?” Sabrina asked. Farther ahead a deer and her fawn strolled across the road. A woman in the car ahead of them leaned out and snapped a picture with her phone. Mama and baby made it to the other side and traffic—all three cars—began to move again. “Pretty cool, huh?” Jenna said, and Sabrina nodded. Good. Another favorable impression made. Until they got to the end of Motel Row and finally came to the Driftwood Inn. Charming it was not. If not for the sign hanging askew and blowing in the wind Jenna would have thought she was at the wrong address. The roof covering the long string of twenty rooms was missing shingles, and one of the rooms had a board where there should have been a window. Once, the place had been the color of a cloudless sky. Now it was faded and the paint was peeling, and a blackish mold was forming colonies on the walls of the motel. As for the promised pool, she didn’t dare look. The chain-link fence around it was bent and sad. If there was water in that pool it was probably contaminated. A lone car, a gas hog from another era, brave enough to traverse the potholes in the parking lot, was camped at an end unit. It was. And the small, two-story gabled house next to it, Aunt Edie’s home, wasn’t in much better shape. Its paint, also once a cheery blue, was as faded and chipped as the motel’s. The long porch and its railing needed painting, and a couple of the steps were leaning at a slant like something in a carnival fun house. The trees and bushes had been taken over by some kind of hanging moss. 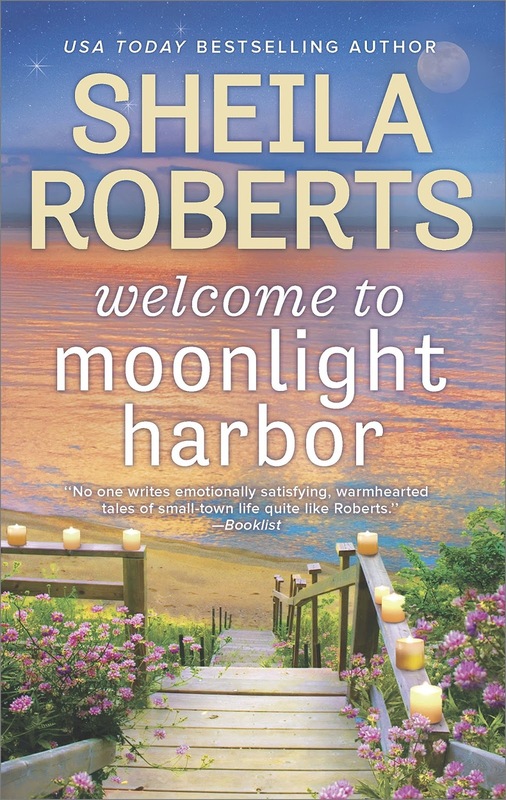 I don't know about you but that excerpt has made me even more excited for this first book in Sheila Roberts' new Moonlight Harbor series! Readers, have you ever moved to, or visited, someplace that was not what you expected? What's your favorite flavor of ice cream? I'd like to try some Sand Pebble! As the book blurb says, "Life is always good at the beach." Where's your happy place? Sheila Roberts has generously offered three giveaways today. 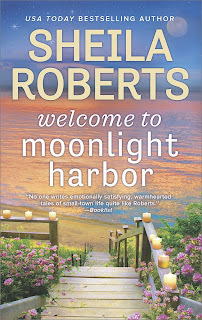 Two randomly chosen people who post a comment will each receive a copy of Welcome to Moonlight Harbor (winner's choice of print or digital - print to U.S./Canadian addresses only). 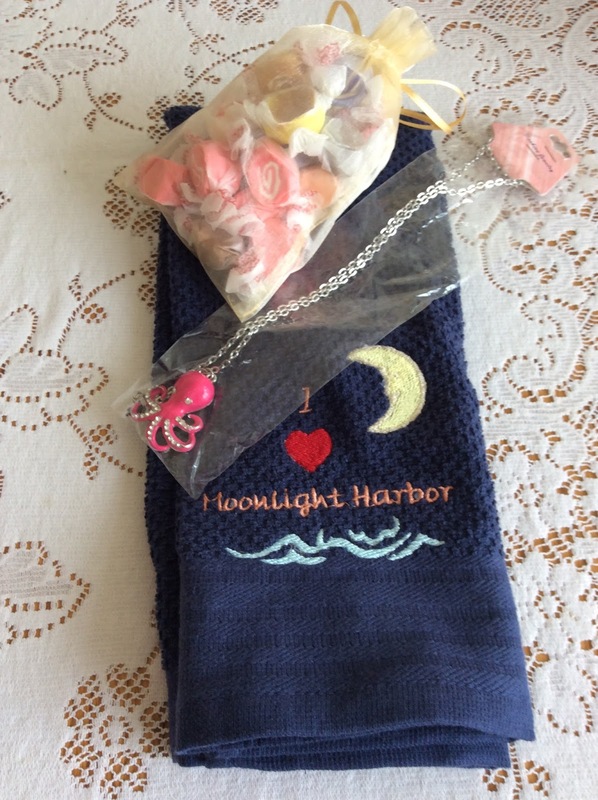 One randomly chosen person leaving a comment will receive a fun Moonlight Harbor gift package put together by Sheila. (U.S./Canada only) Deadline to leave a comment for the giveaway is 11:00 PM (eastern), April 9, 2018. My favorite ice cream is blueberry. I place I visited that was not what I expected was Chicago. All I knew about it was what I heard on the news. I have been twice now and love it. It is not what you see on TV. My Happy place is the Mountains. This book sounds great and I look forward to reading it. My favorite is Pralines & Cream . . . at the moment! I never met an ice cream I didn't like! I really enjoyed the excerpt. I'd love to visit Moonlight Harbor. I think small beach towns are do comfy. :) My go to place is anywhere I can relax and read a good book. This is going om my TRL. My favorite flavor is Friendly's Vienna Mocha Chunk. When I get I cream it's always chocolate!! And I've lived in only two places, Florida and Georgia. Love all her book and can't wait to read this!! Patricia, I'm answering for Sheila today. She went away last weekend and got a horrible case of bronchitis. What she needs is a few relaxing days . . . at the beach! I live in Florida, and the beaches here on the Gulf side are GORGEOUS, white/white powdery sand, clean, fun, lots of pretty shells. I am a big chocolate ice cream fan. My favorite beach is Cannon Beach and I love to visit the ice cream shop on Hemlock! My favorite ice cream flavor is chocolate swirl. I have visited a place that was different from what I imagined. I think that I was stuck in the 50's when I thought of this locale and forgot that time changes places so much. My happy place is a beach which is soothing, calm and gives me peace and happiness since it feels like it is from another era. This sounds like a lovely story about starting over. My happy place is at the beach, too. I don't get there often, but it is my favorite place to relax and read a good book. One place that wasn't what I expected was Hawaii. I grew up going to the big beaches in Florida, and I was surprised at how small the beaches in Hawaii are. What a wonderful excerpt and setting which is perfect. Chocolate ripple is a flavor which I grew up with and loved, but I don't indulge as much now and wonder if it is still available. I visited a fascinating town which was historical and exactly how I pictured it and I was entranced with this charming place. Sometimes I am disappointed when I visit and it is totally different from my view. My most happiest place would be spending time at a lake which I recall from when I was very young. If I could travel there and experience what I did then it would be a complete success. Boating, fishing and swimming in a quiet setting. I lived in AK 1 1/2 yrs. Last place I even wanted to visit became a perfect place of adventure. Ended up loving. Favorite ice cream is Cotton Candy. My feel good spot is at the lake watching sailboats glide by. I would love to have a hard copy of this book to read there. Sounds great. I lived in In. Always try to go back it don't seems to change,my favorite ice cream is strawberry, my feel good spot is by a lake sitting and reading a hard back book. My home is my happy place! I especially liked when my kids and hubby were all home and safe. Favorite ice cream always chocolate. Loved the excerpt from the new book. I love coffee ice cream, even though it doesn't love me! The beach is also my happy place when I can get there. Would love to receive a copy of this book to read this summer while traveling to visit my daughter. Thanks for the opportunity! How can I pick just one flavor? LOL. My favorite is chocolate peanut butter!!! And my favorite place to read in the summer is at our neighborhood pool. A great read and iced coffee are my dream poolside treat! Butter Pecan is my favorite ice cream flavor. My happy place is my backyard. Love to read there. I loved the excerpt. I can't say I ever moved to a place I did not expect but I did go back to the lake we use to stay at when I was young. It was not what I remembered at all. The question about ice cream is hard because I love just about all flavors of ice cream. My favorites have chocolate and cherry in them. My happy place is one of two places. Cape May NJ or Disney World. Thanks for the opportunity and anxiously awaiting your new book. My favorite ice cream is vanilla, I know how boring. You can do so much with it but usually I eat it plain. The place I visited that surprised me was The Bahamas. Where we stayed was beautiful and clean but the city itself ,no so much. I can't wait to read this book. Thanks for the chance. Oh my goodness!! I am so excited for a new series and the ''sneak peek'' makes me want the book NOW, LOL. Whether I win or not, I will be pre-ordering the book and waiting impatiently for the next ones in the series, LOL. So glad you enjoyed the excerpt, Dee Dee. What I like about "our beach" in Washington State is it's stunningly beautiful, and looking out at the water just feeds my soul. Every time I walk along the beach, I realize how blessed I am to live where I live. Thanks for the excerpt! I love moose tracks ice cream, but I love most flavors of ice cream. Yellowstone is my happy place and I try to go every year. Disneyland and Baseball games are my happy places. When I was in the military, my first duty station was Korea. It was not what I expected. I was fortunate enough to go when the 1988 Summer Olympics were being held. I got to attend two of the gymnastics event and I even got to see Bob Hope. I will always remember that time with a range of memories. I cannot wait to read the entire book. I reas the exerpt twice to get the picture in my head! I love all of her books! You sure know how to make an author smile! Thank you! By Sheila Roberts sounds wonderful. Thank you for the opportunity to win.Have a wonderful weekend. When I moved to Oregon from the east coast. It was all tumbleweeds and Jack rabbits. My favorite ice cream is chocolate. My happy place is the mountains. My favorite place to be is at the beach with a good book to read! I absolutely love any kind of ice cream. If I had to choose just one, I would pick death by chocolate. Hawaii with the small beaches surprised me. My happy place is at the beach with my toes in the warm sand or searching for cool rocks, shells or pieces of driftwood with my two adventurous little boys and outdoorsy hubby and then going out for ice cream or gelato. Give me salted caramel praline from Mona’s Chocolates in Langley any day. A place I never expected to fall in love with is a small village in the boonies in Central Mexico called Patzquaro and the ruins of TzinTzunTzan nearby. Somehow it feels like home and I long every day to return. My favorite ice cream flavor is Pistachio and my happy place is Disney World. My favorite ice cream flavor is Lemon merigune pie!! I love visiting the Finger Lakes in NYS, in the summer. Seneca, Keuka and Cayuaga are my most favorite of them all. Wineries along each also are an added benefit! Sitting on a lakeside dock with a good book, glass of nice wine and a dish of any kind of ice cream.. Perfect Day!! I love Jamoca almond Fudge ice cream. my happy place as a child was Mt.Hermon, nestled in the Santa Cruz Mountain range. In the redwoods, pines and close to Santa Cruz beach in CA. When we moved from San Jose, to the little town of Campbell just next door, the house was run down and in need of updating and paint. I grew to love it, but not until my Dad had done a lot of work on it. I am so excited to read what more you will do to have Jenna make that place beautiful, and to give Sabrina a love for this wonderful place. My favorite ice cream is cherry vanilla ,my happy place is Anywhere a good book takes me to w/o ever leaving my home. I loved the beach at Lake Michigan when I was a kid. The sand got hot enough to burn your feet and the water was so cold. And the Gulf of Mexico is so peaceful. Unless of course we are in hurricane season. I love peppermint ice cream, butter pecan, strawberry, cherry vanilla etc, etc, etc. I can't think of any place that has been truly disappointing. I have found that most places have a beauty all their own, just like most people. Buyers French Silk Ice Cream - ooh la la! Walking the beach in North Carolina with the spirit of my mom beside me. Love Potion #31 is a favorite, but I have many. New York City was surprising in that everyone was so nice. Expected rude, pushy people. Home is my happy place. I moved from Dallas, TX to Denton, TX then to Cleburne and I didnt expect Cleburne to be so small or the people to be so nice or so willing to help. I can't wait to read the rest!! It sounds so good! My favorite ice cream is mint chocolate chip! Seattle! I have read several books that take place in Seattle. (Big fan Debbie Macomber!!) It was even better in person. I loved it and want to go back. Chocolate malt ice cream. My happy place is reading in my room. But love going to a lake in Wisconsin, I live in Wisconsin. My favorite ice cream is Bordeaux cherry.the place is Vermont it was more peaceful and beautiful than I thought it would be.the peaceful.place is a lawn chair in my backyard by my flower garden with a book,and I would love to read this one. My favorite ice cream is vanilla fudge twirl. My happy place is my patio with my rocking chair. I can have my ice tea and enjoy reading. As for a place that I visited, it was Seattle in Aug. The weather was wonderful. Mid70's and no humidity. My happy place is either at the beach or sitting by my pool. One of my favorite ice cream says pralines and cream, but I love ice cream with caramel in it as well. I am so looking forward to your new series Moonlight Harbor and after reading the excerpt I can't wait to read the entire book! I do hope this will have a lot of subsequent books in the series as well. I loved your icicle Falls series! The beach has always been a happy place for me. Salted caramel crunch is my favorite ice cream (right now). Would love to read your new book!! Love romance novels!! And haven't read one for at least a year. Thanks for the opportunity to win! I Love Mocha Almond Fudge ice cream. I Like the preview of this book. I am looking forward to new series. I LOVE Sheila Roberts' books! My happy place is the beach with a good book (like this one) & Butter Pecan ice cream. Love all your books!! Your books ARE the happy place for me!!! which ice cream i want varies - sometimes I want a dark chocolate with nuts, sometimes a creamy strawberry - but I often buy Ben & Jerry's Cherry Garcia - love the chocolate chunks! Sounds like its going to be another great series!! My favorite ice cream is Chocolate Marshmallow but it is nearly impossible to find anymore. I used to eat a dish with my grandfather in the evenings when I stayed with my grandparents. Miss the ice cream and miss my grandparents even more! I am really excited about the new series. Looking forward to your new series.. Love your books. Ice cream..love trying different flavors..but vanilla or mint chocolate chip and orange sherbet and chocolate are my go to flavors. I swear my parents wete gypsies. I didn't attwnd one school for a full year until my junior year. I graduated early just so I wouldn't have to go to another school. I love any ice cream with almonds in it. So excited about the new book! The only thing I don’t like chocolate is ice cream!! Hot fudge on top is ok, or chocolate chunks in the ice cream. I do love salted caramel, or any caramel. My favorite is fudge brownie. My happy place is on my couch with a worn out dog on each side of me and a book in my hands. When my family first moved to the town I've lived in for over forty years now, I didn't like it at all. I was all of eleven yrs old, and the first morning that I woke up in our house, I looked out the window and yelled to my mom "There's a bull in our yard!" It was the neighbor's bull, and being much more of a city girl, this didn't sit well with me, being in this rural town. As for my favorite ice cream flavor? A tie between cookues and cream and sea salt caramel, I love them both! We used to go to this place in Wi. and I wanted my kids to see how great it was...the beach was no longer there the water was so high that it covered the stairs going to the beach. It was a disapointment but what can you do I still had my memories. Thanks for the chance to win your book. I love orange creme ice cream, we make it ourselves. My favorite ice cream is Cherry Pie from the local place called Goobers! My happy place is on the shore of Crystal Lake in the Rocky Mountains. After reading the excerpt...I cannot wait to read the book! What a wonderful story about starting over and what better place than at the beach. Any ice cream with chocolate like triple chocolate chip is my favorite. Now I will always think of "Sand Pebble" when I go in to order. My mother always said: "After every storm there is a rainbow if you are open to seeing it." I love chocolate chip mint ice cream! My happy place is my home. Thanks for the chance. I love the homemade chocolate ice cream from a local dairy. I love the mountains of East Tennessee. I am so excited for her new series, thanks for sharing the excerpt! I like mint chocolate chip ice cream, but Huckleberry sounds good too! Thanks! Thanks for the excerpt! I can't wait to read the whole story when it's available. My happy place is the beach but I don't get there nearly enough, so wonderful books with beach settings must suffice. One of my favorite ice cream flavors is black cherry. Thanks for the chance to win a prize package! Love the excerpt, look forward to reading it. I've enjoyed every books I've read by you. Chocolate almond or butter almond ice cream. Lake Placid wasn't what I'd envisioned, it was tired. At least when I went there, placing are ever changing. My favorite place to go is Thousand Islands New York. Love the St. Lawrence River, Clayton and A-Bay. I have seen so many good reviews for this book on several blogs, so I would love to win this also! !